Besides groceries, household consumables such as laundry soap, and medicines, I have purchased two new books for the children that were preordered in August but not published until this month, as well as two other new books for myself. My daughters have been to the fabric store with their grandmother and purchased fabric for their Halloween costumes. I do not believe my husband has purchased anything. In addition, I have purchased two used books and four used shirts for myself. So far I have managed to buy nothing new. I did have to exchange a pack of socks for my son because the first set kept falling down. I don’t consider this buying something new because the original purchase was made in September. I am afraid that by the end of the month I am going to have to relent and buy him a new pair of skate shoes because the current pair have developed holes in the side. This is an inherent problem with skaters, they wear holes in the expensive shoes doing tricks. I will try to convince him to hold off for two weeks. Like Cindy the only things I have bought are grocery, everyday household items like washing powder and the like and of course the odd coffee and cake but that is within the rules. A girl’s got to stay sane somehow, right! So how is everyone else doing who pledged to buy nothing new in October. Even if you haven’t been able to stick to the pledge buying a whole lot less in the attempt is a great for the environment also. Any attempt at turning down the volume of new products you consume is a step in the right direction. 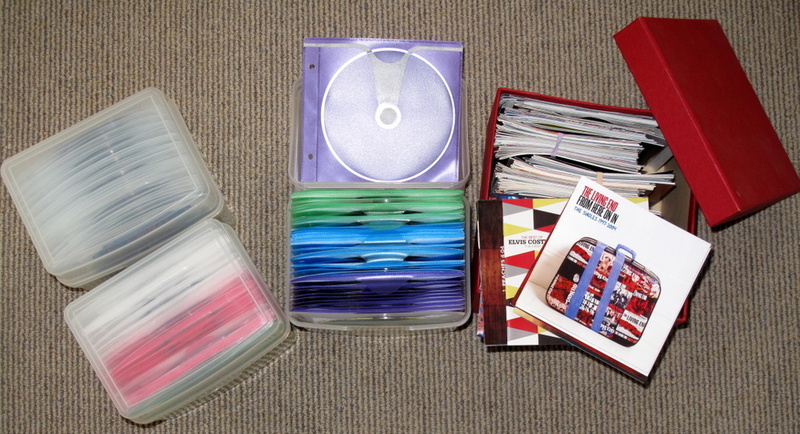 For Chelle and Raesha who wanted to know how my families CDs are stored. Keep in mind that we don’t use the actual CDs very much because everything is on iPod and computers. Just want to say kudos for taking on this initiative! I’ve been doing a Buy Nothing New year since last January and think it’s a great way to challenge ourselves to buy less and be more conscious consumers! good for you I haven’t made a year long pledge but I sure have become a lot less active when it comes to buying anything other that food and other household necessities since taking on my 365 Less Things Challenge. Even some of the household “necessites” I have reduced because there are many ways to achieve something without consuming goods. I use existing plastic containers rather than taking the lazy plastic wrap approach. I have cut back on paper towel use by using the plastic container lids over my microwave dishes and designating one cleaning rag as the toilet cleaner. I used bowls and plastic containers again for mixing and storing rather than using plastic bags… I am glad to be constantly making little improvements in the way I do things in order to live more sustainably. It turns out a lot of things are just convenient rather than necessary. Oh no, I’ve already bought new stuff in October. A friend had a jewelry party, and I gave in to peer pressure. On the plus side, I’m selling several used items on ebay. It’s going very well, and I look forward to those items leaving my house. I’m afraid I have also bought new things in October and don’t even know what! I downloaded kindle books and ordered a couple of cross stitch kits to make for Xmas gifts. I also bought a few items of clothing (on clearance) from Sears, since I had absolutely no clothes that fit. So I am an epic fail in the buy nothing new category. Managed so far to buy nothing new, but it helps when I stay out of the shops! But at least I went equipped with a list and was actually very pleased to cross some things off. However happy I was in the end though, outlet shopping was quite an appalling experience. Seeing all those people buying stuff like crazy had something depressive. And also shopping itsself has something depressive nowadays for me, at least if it is done so excessively. It was a smart thing to stock up on some basics because the prices were lower (though we actually chose to buy better quality at the same price we would usually pay instead of buying too cheap) and I don’t regret buying the things. But I do regret that I cheated myself of the joy you can only have if you buy one piece at a time and really can cherish that one piece. I think outlet mall shopping is appalling too. Sadly, my town has a rather famous outlet mall. When I mention my town, people invariably say, “Oh, the outlet mall!” I’m not a fan or shopping or of the outlet mall, so I just drive on past it on my way to work twice a week. As the mother of two teenage boys, I call socks consumable. Those massive feet can wear out socks in no time. Sounds like skate shoes might fit that catagory as well! thank you for that validation and welcome to 365 Less Things. There are certain things that you have to buy new because you need them and buying 2nd hand skate shoes with the holes already in them certainly doesn’t make sense. Luckily for me he didn’t find a pair of shoes while we were in Melbourne on the weekend so I have had a reprieve. Lets hope he can hold out for a couple more weeks. I think I’ll do a ‘Nothing in November’ that I can manage and a ‘Frugal in February’ ‘Make it don’t buy it March’ ‘Just leave it in the shop June & July’ hahaha have fun everyone! Yay, I love your photos Colleen! So a little cheer for them. I just want to report the ‘e-waste’ bag got dropped off (at no cost, should have been $1.50 per kg) whilst I was at the specialist. I feel SO good to be free of that from the ‘outbay’ as I call it! As for inbound stuff – medicines. My medication supply in my handbag has more than doubled. IN the last two days I think I’ve probably spent close to $300 on medical appts, and ‘stuff’. Also bought some buttermilk, lemons & limes to bake. And paid for food yest and today whilst out. Browsed stuff this week (clothing mainly), but I’m on the ‘no new clothes in 2011 (save for when out of australia)’ so I can resist easily with so much practice! I will have to try a No Spend November. I did a No Spend Day back in September and it went well. But only one day. I am also going to try and live on half my paycheck, which should be interesting but doable I think. I just wanted to share another upside of the uncluttering mentality. Recipes! I’m young, so I don’t have 100 books or anything – 1 display folder and 1 scrapbook. A while ago I tore out anything I’ve never cooked (and never want to anymore). And now, when I find a recipe, I have to ‘try’ it in a reasonable time frame – a week or two ideally. If I love it, it gets pasted in (or into a sleeve). If not, it goes back to the internet mess, or if I did print or snip it out, bin-a-rama. I’m so delighted, this week or so, I’ve cooked three things – new and different. Two successes (the other is still in the oven). And this baking is making GREAT gifts. No one is sad to see brownies (‘cept the Ceolic – now HOW do you spell that hahahah!!) Will attempt wheat and gluten free brownies soon! I’m so jealous you are getting in this whole decluttering so early. Giving up cookbooks is hard. I can almost taste the food when I look at a really nice cookbook. But I apparently love to read recipes more than I like to cook them. I am reducing the stash which started out somewhere near 30 to 8 by now (just yesterday I found myself able to let go of four more when I was rearranging some things in the kitchen) But the goal is to have one handwritten one ( & electronic backup!) some day in the future with only favourites. Another goal is to get rid of DVDs all together which is hard, too, as I love films. But I never seem to find the time to watch them again. Ideealistin – I don’t buy DVDs either, cause like you, I know I won’t likely rewatch them. I could always hire them if the time came when I was wanting to watch something. I own one VHS, cause it was my FAVOURITE film as a kid, and you can’t hire it (I had to buy it from the US, back when that wasn’t all that simple – I live in Australia). But I wish you luck with the recipes, you have a GOOD goal – I mean, why keep something if you don’t use it? If one day isn’t today, why not? If it’s too hard, it’ll probably always seem too hard! Don’t have the ingredients? Then just put them on a list for the next grocery shop. Don’t like it when it’s made? Toss that recipe! (yep happens) You can do it! that reminds me of Sergeant Schultz in Hogan’s Heroes “I know nothing”. You should have plenty of practice with the German accent by now so you can do a Sergeant Schultz “I need nothing!! !” whenever you are near the shops. If my men can spend the weekend at the bike race on Phillip Island and come home with not one souvenir than you can buy nothing also. I have faith in you girl! LOL!!! LOL!!! LOL!!!! I just read your reply, you crack me up [and thank you for your faith in me]!!! I didn’t participate in the october challenge but I always ask the question whether or not I need it. Honestly, I don’t want my children to play with plastics which (could) contain bad chemicals. I think I’ll try to get some wooden toys instead, they seem much safer. (Now, please bear in mind that I don’t have children and that I consider myself too young to get any tomorrow – I’m a student). Although October is a ‘spendy’ month for me I finished off the comp cycle with a good de-clutter! Today I threw in the bin 27 clothing items (I will use that term loosely coz they really didn’t look like clothes) and I filled a donation bag with 91 items of clothing. I got sick of everything falling out of my sons’ wardrobe so I gave it a once over, I never realised how much stuff he had in there, so then I got stuck into my husbands’ WIR and cleared it out. The space feels lovely! welcome to 365 Less Things and thank you for dropping by with a comment. I think it would be great if you would commit to Buy Nothing New in November since you missed October. Go for it. Good luck with your new blog I hope you enjoy doing it and get as much inspiration and fulfilment out if it as I have from mine. P.S. When friends or daughter try to pressure me into purchases, I just say “I’m getting rid of stuff: I don’t want to bring more in!”. oh and I will try a “Nothing in November” as well. it is hard to not buy when you are renovating but, judging by the way you are borrowing and utilising items that family no longer want, I think you have already mastered the idea of being a conscientious consumer. I think that is the idea that the Buy Nothing New Initiative is hoping to propagate. So well done you. Ok, all my readers friends who pledge to participate in Buy Nothing November, Colleen and I will be holding you to it!